Is your innovation organization running on empty? Crushed, lacking creative juices? Time to add some fizz again with principles from the book, Conquering Innovation Fatigue. 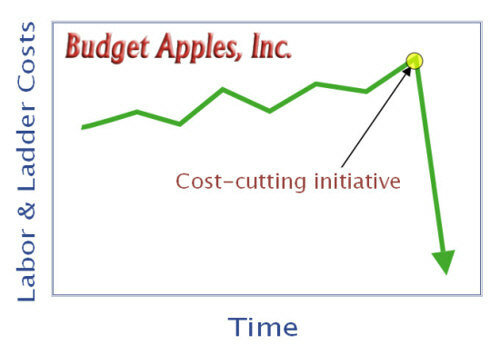 As part of the series on Magic and Innovation, today I’m using a simple effect to illustrate what can be achieved with an innovation organization. Available on Youtube at http://www.youtube.com/watch?v=5JVr017KZBw. One of the top nine “innovation fatigue factors” that we address in the book involves the challenges that stem from governmental policies and regulations. Chapter 14 explores this in detail, and urges government leaders and policy makers to listen to the “voice of the innovator” before they pass new laws or add new burdens that may have unintended consequences on innovation. Ford Motor Co. CEO Alan Mulally said government regulation in many ways has hurt innovation among businesses and manufacturers in the United States. One hears this a lot from small business owners–it’s refreshing to find a CEO of a large company willing to hint that there might be problems. “Freeing people up” to innovate and to grow their business makes a lot of sense in many areas, where one can argue that innovation is hindered by excessive or overly burdensome regulations or taxation policies. Getting the balance right is tough work, we admit, but somewhere in the process, we hope that policy makers will go the extra mile to consider the potential impact on innovation, and not just from the perspective of a few Fortune 100 CEOs, but also from the perspectives of the innovators and entrepreneurs themselves who create the technologies and business models that drive so much of the economy. 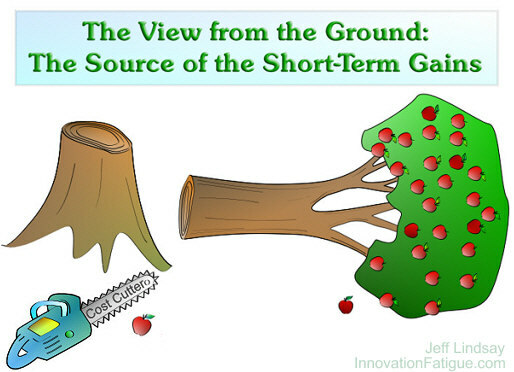 Innovation is a plant that, once wilted, can be difficult to revive. The culture of innovation needs to be nourished carefully and kept vibrant for an economy to thrive. I love the term “Innovation Fatigue” to describe the weariness that can beset organizations and sometimes whole sectors of a nation’s economy when it comes to innovation. The term has been floating around for some time. For example, “Innovation Fatigue” was the title of a 1995 article on educational innovation in Scotland, published by The Times Higher Education. A 2004 book, How Industries Evolve: Principles for Achieving and Sustaining Superior Performance by Anita Marie McGahan (Harvard Business Press) also uses the term on page 5. Bruce Nussbaum of BusinessWeek has done much to spread this term, using it in at least three articles: “Do CEOs Have Innovation Fatigue?” from May 2004, “Broken Promise Fatigue Rather Than Innovation Fatigue” in May 2007, and “Innovation Fatigue is Fatal” from March 2007. BusinessWeek also quotes James P. Andrew, a senior vice-president at BCG, discussing “innovation fatigue” in May 2007. The earliest examples I’m aware of come from a 1974 educational report from Portugal and in 1975, again in the context of education, on page 6 of Curriculum Innovation by Alan Harris (New York: Taylor & Francis), who bemoans innovation fatigue among teachers. (John Nisbet apparently also used the term in a 1975 publication on education, but I don’t have that reference.) Since the 1970s, there have been repeated occurrences of the term in the literature on education, as one can see in a search of Google Books. If you know of other early uses or unusual uses of the term, please let us know! I’ve just added a few excerpts from the book. Click on the “Excerpts” button on the menu above. Later I’ll be adding some material from our chapter on the “Horn of Innovation,” which I think could be one of the most helpful chapters for innovation leaders in many firms. I also love the story of innovation behind the horn itself. While our book, Conquering Innovation Fatigue, has a lot to say on innovation and managing innovation, we also have important sections on intellectual asset strategy. An entire chapter, for example, is dedicated to intellectual asset tools for dealing with disruptive innovation. One of the key concepts we discuss is what we call “360 IA” (three-hundred and sixty degree intellectual assets). The 360 IA approach considers the full scope of intellectual asset tools for protecting your innovation. Patents are just a part of that, and even then, we challenge you to think beyond conventional process and product patents, also considering unconventional approaches that might fall within the realm of “business method patents.” Don’t overlook design patents, either. (See PatentlyO’s discussion of Google’s design patent for its homepage layout.) Make sure that your patents tell a story that lines up with your marketing story. Are the unique selling points of your concept also directly in the focus of your patent strategy? Moving beyond patents, there are creative things that can be done with other forms of intellectual assets such as trademarks. Creative trademark applicants have found protection not just for the appearance of the product per se, but for secondary aspects such as the characteristic water spout of Yamaha’s WaveRunner® personal water craft (U.S. Trademark 74321288). Defensive publications are one of the most-effective and routinely neglected intellectual assets. I discuss them in the SharpIP.com post, “Are You Neglecting the Power of Defensive Publications?” If you are like most people and most corporations, the answer to that question is probably yes. 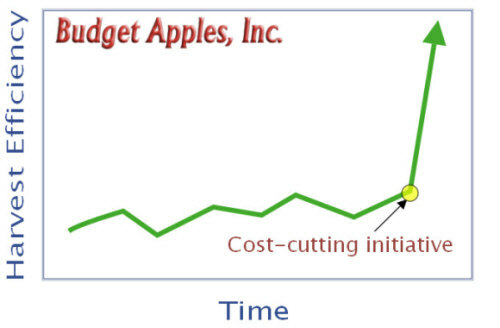 Millions of dollars of headaches could frequently be avoided or greatly reduced by routinely publishing defensive disclosures aimed at creating prior art regarding minor improvements or seemingly obvious various to your patented technologies, thereby reducing the risk of others creating a picket fence around your own estate that limits your freedom. Potentially disruptive innovations or feared competitive acquisitions, mergers, or new product efforts can also have some of their sting removed through a creative defensive publication program. It’s not easy in typical corporate cultures, and specific actions must be taken to ensure that targeted disclosures are written by capable people and properly screened and tracked. The review phase is especially important, for once you pull the trigger and release the publication to the world, you can’t pull it back and change your mind, as you can with a patent during the months before it is published. My efforts to implement an aggressive defensive publication program at Kimberly-Clark Corporation were an important part of my work there, in spite of having had the title Corporate Patent Strategist. I actually spent a lot of my time working to advance publications and other non-patent forms of intellectual assets. A 360 IA framework also demands attention to digital intellectual assets. This especially includes domain names, which many great companies tend to overlook, sometimes until it is too late. When you have some proposed names for a new product or service, go ahead and register the domain names ASAP, long before you settle on details and approach launch. They are cheap–unless you let someone else get them first. There are many free digital intellectual assets to consider as well, including YouTube channel names, Gmail accounts, Facebook names, Twitter accounts, Squidoo lenses, etc. Get these early. You don’t need to use them, but make sure you own them for your brands and emerging product concepts. The great thing about the 360 IA approach is that it helps you proactively craft an intellectual asset estate with more purpose, more agility, and much lower cost than is possible by relying on patents alone. You can create an estate that enhances your marketing strategy. If you are looking to license or sell your technology and IA portfolio to someone else, you can greatly increase the value by presenting a holistic intellectual asset estate that considers many bases and is aligned with your marketing story. It really gives you a chance to shine and be more effective at lower cost. Think beyond patents. Think 360 degree IA.